Home AppVirality & Funding – And How We Got The Couple Together! First things first, Looking to run in-app referral programs? We recently launched Personalized In-App Referrals. The humongous growth in the start-up ecosystem cannot be missed, however getting the idea validated still remains the biggest challenge for entrepreneurs. This is vital especially when a start-up is seeking funding from probable investors, VC’s or angels. During our quest to raise funds, we learned a lot about networking, raising capital, understanding terms and incorporating “AppVirality Inc” in the USA. Our challenges weren’t battled alone, and we were lucky to have a strong support and guidance from our mentors. But for many first-timers the road is dodgy and therefore we decided to share this story (dissecting each nugget) for entrepreneurs who can draw something out of our story! A lot of start-ups die an early death, due to lack of sufficient funds, and we recognised the fact. This involved taking tough decisions, the toughest one being whether to raise capital or remain bootstrapped. Though nothing can beat the joy of bootstrapping, we chose to raise some quick capital and get awesome people on board to support us through this exciting journey. It is also notable that we received 60% commits within 48hrs and 100% commitments within a week from the moment we decided to raise capital outside our periphery. Quick Tip: Decide the way forward quickly and early. Bootstrapping is an option, however for funding ensures longevity of the product and the people working with you. Email that all started with! That was the eureka moment of our journey and for a moment delivering a convincing pitch became secondary to this excitement. While still recuperating from the sweet shock of this email, we got on to a quick call with Rajan, which later led to a face-to-face meeting with him. Fresh from our graduation at Microsoft Ventures Accelerator Program, we didn’t fail to impress him (at least we hope so). This was in June 2014. Quick Tip: Be on top of your product, you wouldn’t know when the opportunity may strike! Also NETWORK, NETWORK and NETWORK to increase visibility. Being part of an accelerator program will also provide you an added advantage to be heard and seen. Later in July, 2014, we were in Delhi as AppVirality was shortlisted amongst the top five start-ups to pitch at Start Tel Aviv competition, but couldn’t meet Rajan as he was busy that day. After a week, Rajan happened to be at ISB Hyderabad for a keynote speech and we decided to use this as our second opportunity, and that’s when we decided to drive him back to his hotel! It was a pitch on wheels. Yes, literally Ram was driving and I was pitching in the back seat. He asked us about the amount we needed to raise, along with other details. While I was explaining our plan, he said “You’re a salesman, you’re sold”. Super fast, aggressive, that’s Rajan Anandan for you. Quick Tip: Do not miss any opportunity to sell/showcase your product to anyone, anytime….err barring the funerals. As an entrepreneur, one need to hustle, everyone does it…so did we. During our conversation, Rajan had inquired us about our investor deck being ready, which wasn’t in place till then. He asked us to create one, so that we could reach out to other connections and get commitments. Within a few hours, we created the initial version and sent it across for his quick feedback. His insights and enthusiasm helped us throughout the process. Quick Tip: Be prompt in accepting and implementing changes. No one ever gained from lost time. Keep an investor deck ready. The India Internet Group and TNN Capital took a couple of days to decide numbers. Overall, we closed the round pretty much within 10 days. At one stage, we were oversubscribed and had to reject and trim down existing investor commits. This was done to accommodate the more suited ones. This wasn’t easy again (since we couldn’t accommodate all, our apologies here are genuine) but our investors were very supportive throughout this process. Quick Tip: It is a very unprofessional approach to keep people hanging, and its best to accept what one can deliver. Incorporating a business in the US isn’t easy; especially when the founders are Indian nationals. This may also get tricky since no one would want to consume funds and travel such distance only for incorporating the company. Our second requirement was getting a workable business bank account. That’s when our legal expert, Mr. Anil Advani and his team helped us with the legalities. Since it’s a detailed process, a separate article on this would make more sense- Thank you Sampad for introducing us to Anil. The terrific trios of this heading are essential to gain the spotlight. Ever since we started AppVirality, we have pitched/attended every major start-up event and it includes Startup Asia-Singapore, Unpluggd, Tel-Aviv, Seedstars and Techsparks to name a few, not to forget our own Microsoft Accelerator (demo day) which got us a lot of mileage. Tapping the right opportunities is critical and our advice is to make as much buzz as possible. Let people be curious about what you’re building and pitch wherever you foresee an opportunity. In our case, we were betting more on product than anything else. We believed in the fact that it’s not hard to raise money if you have a solid solution. This is what Microsoft Accelerator taught us. To be honest, we were not really keen on having mentors until we met Shyamal and Mohit while at Microsoft Accelerator. This memory is closest to our heart and cannot be put into words. The duo spent hours mentoring us, and also gave us the freedom of walking into their offices anytime. An advantage of being on MS accelerator was being surrounded by exceptional minds like Mukund Mohan, Ravi Narayan, and Rajinish Menon for any advice. We would strongly suggest having mentors, but being very cautious while choosing them. We had often heard that a team is more important than the idea. 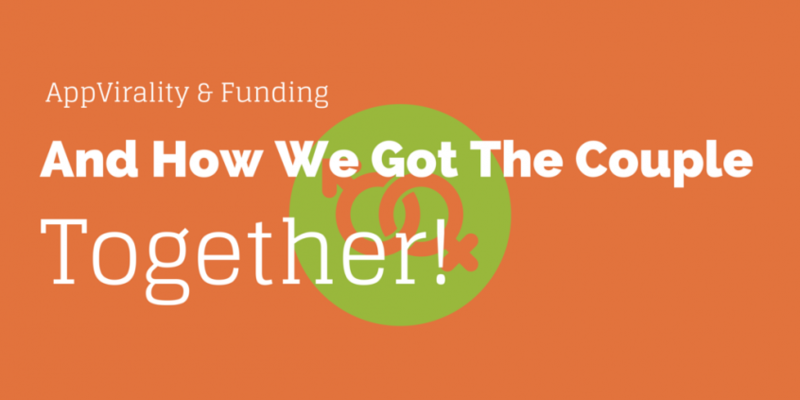 But this funding exercise made us realize the real value of a kickass team. We decided early on to split the tasks as per our niche and acumen. In the beginning, Ram took the sole responsibility of the product bit while I dabbled in everything else that was required for AppVirality. This segregation helped us to concentrate and deliver better and it worked beautifully for us. We have a solid team of three developers including our close ally Madhu who has joined us recently. The total team size, at present, is six including our developers Suneel and Shravan and our inbound marketing wiz, Taru. It’s always better to be exposed and let the world know what you’re doing. I don’t know about others, but this worked well for us. We had a compelling landing page from day one, which helped us gather almost 400+ leads, media buzz and attention from Investors. This was done despite the fact that a lot of entrepreneurs believed that it isn’t the best approach since our product wasn’t market ready. Guess, we proved them wrong. If you have a choice, be very selective with Investors. It’s not just about money; it’s about right set of people to boost you through the long journey. People often suggested us to close the round at the earliest but we were always cautious. We strongly believed in having a kickass team and right set of investors. Be shameless when you need help. Never hesitate to connect with fellow entrepreneurs or mentors or anybody for that matter. During the process, we bugged, all these fellow entrepreneurs, a big thanks to Ankit, Manan, Amritanshu, Srikrishna, Nischal and Raja Hussain. If you decide to register the company in the USA, we would strongly recommend choosing the right lawyer who can spend a good amount of time and make you understand things. Since the process is completely different, make sure you understand everything. Thankfully, it was very smooth in our case (Dig deep and ask as many questions as you may, before you understand things completely). Again, your lawyer should make you understand each and every line of it. We spend one full day trying to understand each and every word of it, yes, it may be boring, but it’s still very important. We even had long calls, with few good friends like Ankit of AdPushup who literally explained me few important terms. But anyways, it was a very fair term sheet for us. Nothing much to negotiate. Raised money, no big deal. What’s next? Raising capital does not equate to success. It’s just a relief that few more people believed in your idea other than your family and friends. At AppVirality, we have geared up and are constantly learning and improvising our product. In fact, we believe in forward thinking and taking it to the next level. Let us end it with an elevator pitch – AppVirality is a ‘Plug n Play Growth Hacking Toolkit’ for Mobile Apps. We help our clients in Increasing App Installs and Monthly Active Users (MAU’s) by 38%. If you’re looking to boost your app downloads and engagement, do consider AppVirality and give it a try! Ram & Laxman | AppVirality. Awesome article, you have cleared my lots of doubts. all the very best for your future endeavors. Thank you Karan. Glad that was useful! Great job detailing the entire process Laxman. Best wishes for many more milestones ahead.